The Duvet cover is made from 70% Polyester & 30% Cotton. Wash and handling instructions label on the packaging. 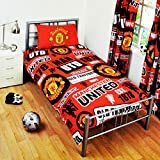 The Manchester United FC Patch Single Duvet Set comes complete with one pillowcase which measures approx 50cm x 75cm, the duvet cover measures approx 135cm x 200cm and will fit any standard single bed.